Perhaps the most uniquely American of all dances, the Swing brings forth a buoyant carefree movement. It’s one of the dances that becomes contagious. 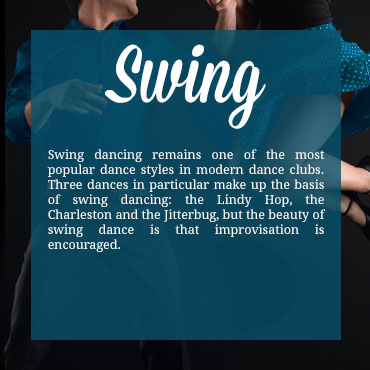 The Lindy (Swing) picked up where the Charleston left off. It had "swing-outs," "break-aways" and "shine-steps." With the birth of "Swing" music in the mid 1930’s, the Lindy climbed the social ladder. In August of 1935, at the Palomar Ballroom, band leader Benny Goodman played a Fletcher Henderson arrangement of "Stompin’ at the Savoy." The rest, as they say, is history. The dance craze swept the nation, and depending on where you lived, it was the Jitterbug, the Lindy Hop or the Swing. Since those days, each successive generation has "discovered" the fun of Swing. This most uniquely American dance is enjoyed all over the world. 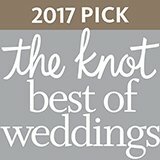 Swing, Jitterbug, Jive, Shag, Lindy Hop, etc. are normally written in 2/4 or 4/4 time with the musical accents occurring on the second or second and fourth beats of a measure. Swing includes two general rhythms: Swing Rhythm — 1, 2, 3, & 4, 5 & 6 or its equiva­lent; Lindy Rhythm — 1, 2, 3 & 4, 5, 6, 7 & 8 or its equivalent. Swing may be danced comfortably over a wide range of tempos. A side step or triple step (shuffle) followed by a rock step done to lively music is the fun­damental pattern for this dance.